If you are looking for inner peace and spirituality, Lantau Island is the place to go to. Hong Kong, China -- After nearly 10 days in Hong Kong, a British colonial land of yesteryears, I still felt I was missing something. I had crisscrossed between Kowloon and Hong Kong islands several times, exploring some of their star attractions, photographing the exube rance of the islanders and of course the ultramodern skylines. I had visited several monasteries, Buddhist temples but none came close to experiencing the authentic spiritual aspect of Buddhism. My quest for inner peace and spirituality was soon to be satisfied with a visit to the Giant Buddha and Po Lin monastery in Lantau Island. I woke up to a beautiful sunny morning, which, by the way, is a rarity in Hong Kong during March and April months. After 45 minutes and three train changes, I reached Tung Chung station which is the western terminal station on the MTR. The journey was impressive with warm, sun-lit, spectacular coastal scenery and beautiful beaches. I came out of the station to a much different Hong Kong, much quieter and less crowded. Lantau Island is geographically twice the size of Hong Kong but has a population of about 45,000 compared to that of more than a million in Hong Kong. The island is known for its fishing villages, beaches and the Po Lin Buddhist monastery. It is also a favourite destination for hikers and adventure geeks who tramp more than 40 miles of designated trails. However, the star attraction of the island continues to be the Giant Buddha visible right at the entrance of the Po Lin Monastery. Weighing a massive 250 tons and scaling a height of 75 feet, this statue claims to be the world’s largest outdoor Buddha. I hopped on to a cable car and preferred to cover the four mile journey to Ngong Ping village with ease rather than undertake a hard, back-breaking trek or a bus journey. Travelling at a height of over 700 ft, the ever-changing panoramic views unfolded the Hong Kong International Airport, the verdant, mountainous terrain of Lantau Island and the Tian Tan Buddha Statue. Unlike the neighbouring Hong Kong, nearly 80 per cent of the island is virgin land. Spring was at its best with colourful flowers and green leaves contrasting each other. At the entrance to the village is the Ngong Ping tea house, set amongst beautifully landscaped garden in tranquil surroundings. The tea house is tastefully decorated and the demonstrators were attractively dressed in traditional Chinese attire and spoke fluent English. After a hot cup of ceremonious, traditional Chinese tea and the finest cakes in exquisite chinaware, I felt rejuvenated. The monkey’s tale at the nearby theatre is another attraction of the village. The small auditorium is decorated to create the ambience of forest life. The panoramic screen is artificially blended into a wall of stone carvings. Primarily targeted at young children, this computer generated animation presents a show inspired by the famous Buddhist Jataka stories. The special effects and sound are so wonderfully synchronised that both the young and adult audience enjoy it equally. My journey into the spiritual world of Siddartha was coming closer. With a headset to listen to the preachings of Gautama Buddha, the journey begins at the courtyard with a Bodhi tree where a Sandstone statue of Buddha is enclosed in the hollows of a big trunk. Through the mist and incense, a voice introduces the story of a man who asked himself, “Who am I and why am I here?” This is the story of how a prince named Siddhartha turned into the Buddha. The next 20 minutes of the narrative walked us through Buddha’s path to enlightenment! A line-up of shops selling incense and other colourful small souvenirs brought me directly to the feet of the Giant Buddha. Climbing up 260 steps, I stood like a Lilliputian, directly looking at the face of the Buddha. Turning around from that view was the panoramic mountain scenery and an exquisite monastery painted in bright yellow colours amongst the lush green vegetation. 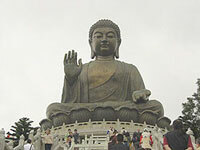 The statue itself sits on top of the 520-metre-high Ngong Ping plateau. Right at the bottom of the circular pedestal of Buddha are the beautifully designed Kwun Yum statues which face the Buddha. The pedestal of the statue is a three-storey exhibition hall with a big bell inside. The bell is delicately engraved with Buddhist figures and scriptures. The spot also offers a 60 HKD vegetarian meal; a reminder of how everything is commercialised these days. However the impressive views from the restaurant compensates for the rather expensive cheque. Satisfying my senses and soul, I came down the stairs to the Po Lin monastery. Built in 1920 by three Zen masters, the main temple houses three bronze statues of the Buddha, representing his past, present and future lives, as well as many Buddhist scriptures. The place is magical with colourful decorations and an ambience that promotes a solemn attachment of your inner self to the spiritual world. Serving as a place where Buddhists seek enlightenment through meditation, the tranquillity of this monastery is only disturbed by visitors, especially on weekends. As I walked back to the sky rail, I felt deeply satisfied and very much at peace with myself. The whole atmosphere was relaxing and I wonder whether it was the incense sticks, the architecture or the statue of the Buddha himself that lifted my spirits.